Railroad commissioner F.H. 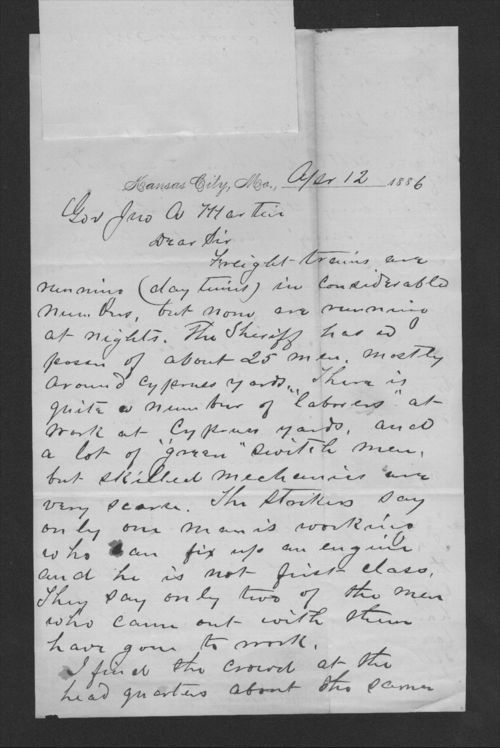 Belton writes to Kansas Governor Martin of Topeka from Kansas City, Missouri. Belton tells Governor Martin that there are a number of laborers at work at Cypress yards, and a lot of "green switch men, but skilled mechanics are very scare". Concerned about disorder and lack of progress during the strike of 1886, Belton reports "out of order" cars are rapidly accumulating on the side tracks. Few section men are at work. In February 1885, railroad shop workers walked off the job because of a cut in pay and reduced hours of work. Governor Martin was able to negotiate a settlement to the strike but problems continued throughout Kansas, Missouri, and Texas.